Elon Musk is many things -- an engineer, the CEO of SpaceX, a suspected supervillain -- but he is also a troll of the highest level. The co-founder of Tesla is known for starting new projects seemingly spontaneously -- look no further than the Boring Company flamethrower -- but he's now claiming his newest venture will be a candy company. And, well, it's hard to know what to think. Musk says he's "super super serious" about his transition into candy mogul, but that's a bit suspect considering the outburst seems to be an elaborate trolling of billionaire investor Warren Buffett. Trolling is only truly successful if it's near impossible to tell whether the whole thing is in fact earnest, and by the criterion, Musk is definitely winning. It started last week on an earnings call when the Musk criticized "moats," a term that Buffett coined that refers to a buffer around a company that allows it to keep its competitive edge. Musk said that "moats are lame" and that "pace of innovation" was more important. On Saturday, that led Buffett to retort, "Elon may turn things upside down in some areas. I don't think he'd want to take us on in candy." Buffett is the CEO of Berkshire Hathaway, which owns See's Candies. Basically, he was saying that there are companies with sustainable "moats" and that the tech industry wouldn't impact something like candy. Which, as far as we can tell, led to Elon Musk tweeting all this. So it's hard to say whether this will all stay on the TL or if Musk will start an entire company to prove a point. This is the man who sold $500 flamethrowers. 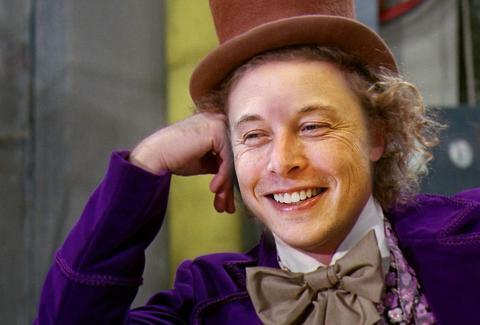 if elon musk is saying he wants to start a candy company he has already spent $400 million of venture capital to turn three children into blueberries. Just make Westworld real God dammit. What do you think we’re living in? That certainly gives you something to think about as you eat your Elon Musk candy bar while driving your Tesla to pick up your Boring Company flamethrower.